Home What Is UK Editing? We are named UK Editing, as we are proficient in this specialised style of editing that is suitable for research scholars enrolled in the UK universities. While this editing style follows the basic rules of editing, the referencing and formatting styles, as well as the linguistic standards are maintained and followed according to the guidelines offered by UK college boards. In British English, some spellings and terminologies are different from those used in US English. Hence, the editors and authors need to be very careful while following the correct style when it comes to reviewing UK research documents. While it is tough to get admission in well-known UK colleges, it is even tougher to attain a positive review for research reports and assignments. This is because of the stringent review and marking policy followed by most UK universities. We, at UK Editing, focus on giving the best possible review service to scholars and manuscript authors. To meet our commitment for quality, we have put in place a trained team of editors who have in-depth knowledge of the rules and regulations prescribed by leading UK universities. Moreover, most of our editors have attained their postgraduate and PhD degrees from the universities in UK, such as the University of Oxford, University of Cambridge, Manchester University, London School of Economics, and others. Additionally, we have on board some skilled and experienced writers and proofreaders who have got their papers published in some reputed journals of UK. All our team members have detailed knowledge of professional style guide, as well as of native UK English, which makes them edit the papers in a proper manner and use correct terminology that may be acceptable by a UK institution. With the help of such a proficient team, we are able to assist scholars in attaining at least 2:1 grade. Our professionals interact one-on-one with every client and gain their project review requirements before they begin checking their research documents. Thus, clients can be sure of complete compliance with the instructions issued by their colleges or universities. 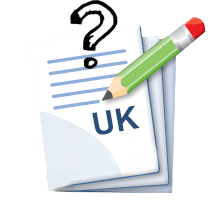 To know more about our UK review or editing services or request a quote, simply send us an email at quote@ukediting.com or call us at 350 200 41323. You may also get finer details on individual services on our website. Feel free to explore.